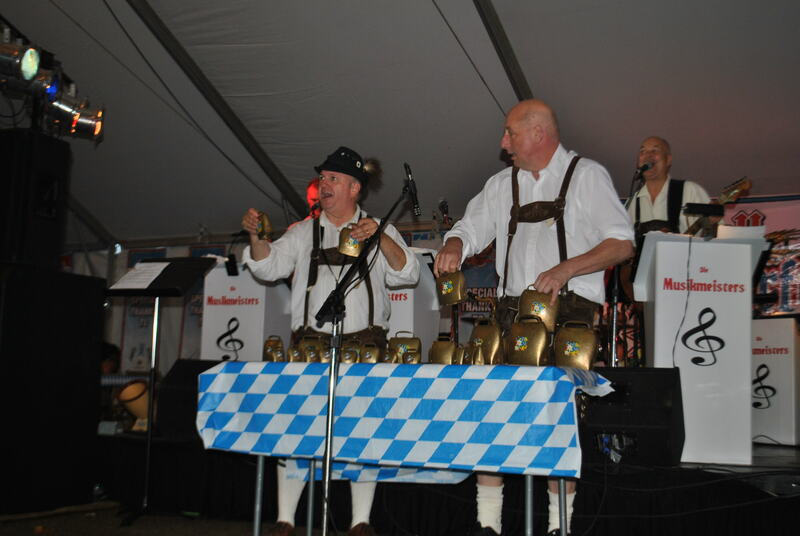 A little bit of Bavaria came to the Twin Cities Oct. 6 when the sixth annual C-U Oktoberfest benefit for Developmental Services Center was held in downtown Champaign. The lively sound of polka music and the aroma of brats and Bavarian-style pretzels filled the air for nine hours under big tents at the corner of Neil and Washington streets. Taking a spin around the dance floor with Chiaramonte was Jon Hanson of Mahomet, who was at the event for the third year, largely because of his and his wife’s love for the polka. “We’ve done it for a long time,” he said. Festival-goers could fill their steins with traditional German beers from local breweries The Blind Pig, JT Walker’s, Destihl, Triptych and Riggs. Destihl and Chester’s BBQ sold everything from authentic sausages and sauerkraut to German potato salad and schnitzel on a stick. Some even got in the spirit by donning their dirndls and lederhosen. Founded in 1972, DSC supports children and adults with developmental and/or intellectual disabilities in Champaign and Ford counties. Oktoberfest began when Crown Prince Louis, later King Ludwig I of Bavaria, married Princess Therese von Sachsen-Hildburghausen on Oct. 12, 1810, and all of Munich’s citizens were invited to attend the celebration held on the fields in front of the city gates. The CU Oktoberfest started when Eric Robeson and Achim von Bodman, who had been to the Munich Oktoberfest, approached DSC with the idea. “They really wanted to see Champaign-Urbana have one, but with a charitable component,” DSC Director of Development Janice McAteer said. Destihl served about 200 pounds of bratwurst, and at least 1,000 pretzels were sold. “Even though it is a fundraiser, it’s also really important to us as an organization that the vendors also succeed in promoting their beer or food,” McAteer said. For many, she said, Oktoberfest has become a family tradition, and some people even take photos for their Christmas cards under the Oktoberfest arch. “It’s an opportunity for us to give back with a shared experience,” McAteer said. The CU Oktoberfest’s 10-person steering committee starts planning the event about 10 months in advance. After its annual Tree of Hope campaign, Oktoberfest is DSC’s next largest fundraiser, and McAteer predicts that it’ll continue to grow. “We would really like to see the event becoming more than a one-day event,” she said. McAteer said part of the reason the event has taken off and done so well is the amount of community involvement in Champaign-Urbana, something that DSC benefits from. McAteer credits the sponsors who assist in covering the costs with helping to make the event successful.